If you’ve been looking for a high-quality robot vacuum that works with Alexa and it’s going to break the bank, your search just came to an end. 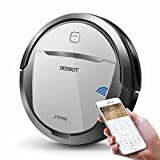 We’ve tested a few different models and found that the ECOVACS DEEBOT M80 Pro Robot Vacuum Cleaner is by far the best affordable robot vacuum cleaner that supports Amazon’s beloved voice assistant. It features a five-stage cleaning system with great suction that works well on hard flooring and low-pile carpet. It also doesn’t get tripped up by pet hair, which is a common problem with some low-cost models. Clip the $30 on-site coupon and you can get this awesome robot vacuum for just $199.99!